As usual it has been a long time between posts but so much has been happening, and getting down to business is not my great strength. 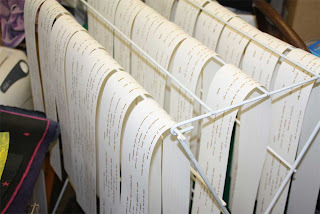 I've been working on my edition of books for BookArtObject, and I think I've reached a point where I can begin assembling them. Here are a couple of photos of my progress. First the paper on my work bench being ruled up for trimming. Next the cut strips, Gocco printed, drying, before measuring and folding. I'm not a very competent printer and so I'm not completely happy but I've consoled myself with the thought that these books are very much hand made. The actual shape of the books can be seen here, though I've changed the measurements and they will be smaller than the one pictured. On the family front we've had the first day of big school and a 5th birthday party. Very exciting happenings and Fia looks so grown up in her new school uniform. We are very lucky in that her little local primary school (government run) is considered one of the best schools in the state. The two little ones also go to preschool (right next door to our house) three days a week and they love it, so we have three happy campers, thank goodness. 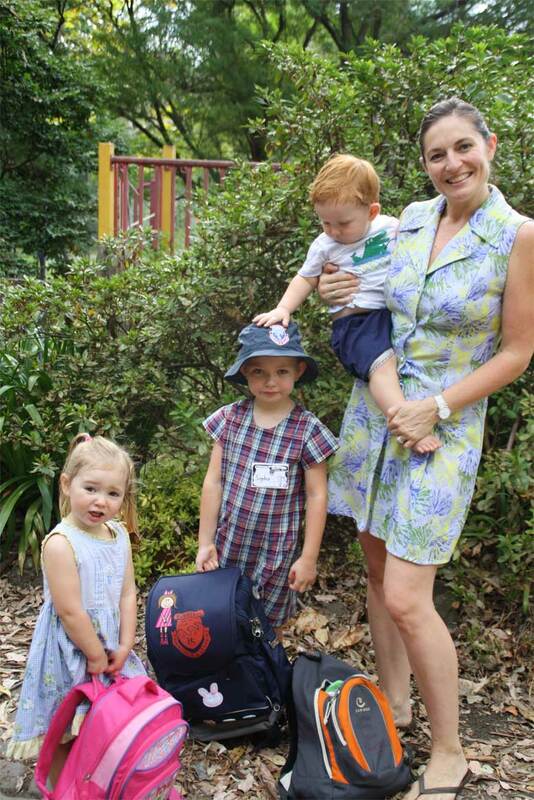 Look at their enormous school bags! I have a new obsession to add to the others. I've done an online course with Michael deMeng, learning to use his paint effects. I've been collecting bits and pieces all my life, I have containers of anything that takes my fancy, which is just about everything, and now I want to actually make things with my "stuff". To do the paint effects I had to buy new paints - who doesn't like doing that? I spent a small fortune on them so now I am obliged to make use of them and I'm all set to start creating. 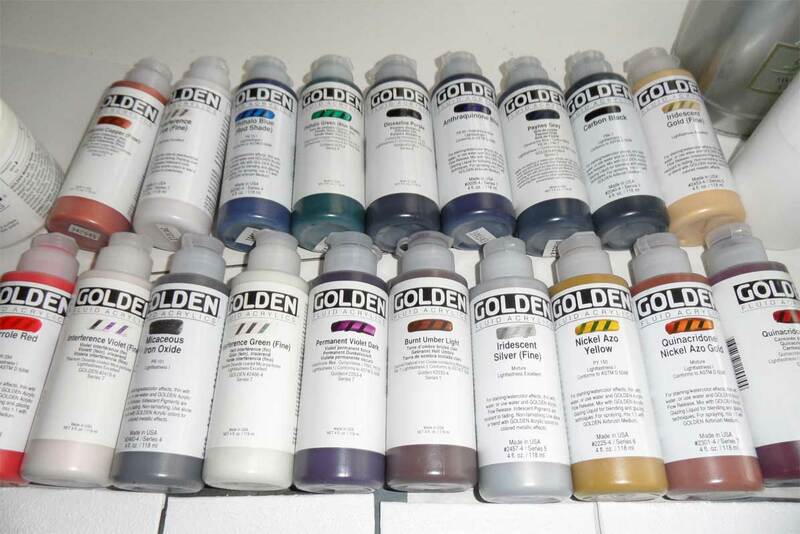 Here are my paints. A warning. Buying them in Australia cost four times as much as if I'd ordered them from the US but I needed them instantly to do the course. And they are gorgeous! I've just spent four amazing days at my daughter's beachside house - in Bundeena, in the Royal National Park in New South Wales. The Park is the second oldest in the world, after Yellowstone, and apart from wonderful walks and scenery, has really beautiful beaches. We packed so much into the four days that I'm feeling I need a little holiday to get over it all. 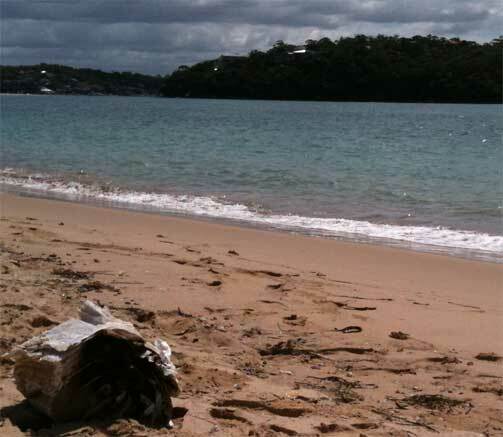 Here is a tiny glimpse of Bonnie Vale Beach. Here are a couple of links I'm enjoying at the moment. Advanced Style, which shows just how stylish elderly people can be in New York. As I've never been blessed with "style" I feel as if this is something to aspire to when I'm in my 80s. And a booky link. I'd seen some of these before but not all. I see that Brian Dettmer is in there - I don't think I ever get tired of seeing his work. Here is some more of it. We are in our second week of autumn/fall and so far it's still hot and humid. In spite of most of Australia being flooded (still) we are in a mini drought here in sunny Wamberal. I'm so looking forward to autumn, with the milder days, cooler nights and that wonderful feeling in the air that you only get here in spring and autumn. 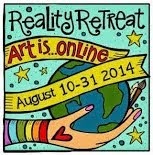 If you're an assemblage artist and find your way here, please let me know. I love to hear from everyone, whether your interest is in books, natural history, rusty things - or anything at all. Anxious to see how you incorporate The DeMeng style in your work:) Mine will never be the same:) Such a wonderful course and giving instructor!! My posts are lack to...too much to explore and try with the new Golden Paints. Di: stop choking with laughter. You're not old enough yet to be in Advanced Style. Next trip to NY maybe... Bundeena is easier to get to. Ronnie: wish I could say I'll be next finished but there are still things to figure out. WS: just having a last look at the videos. Life changing in a way. Judy: email soon with all the pics etc. Holly: I love the paints and the whole deMeng experience. You are part of my inspiration to take this path... thanks. Sandra, thank you for visiting, and emailing. You are in my thoughts. 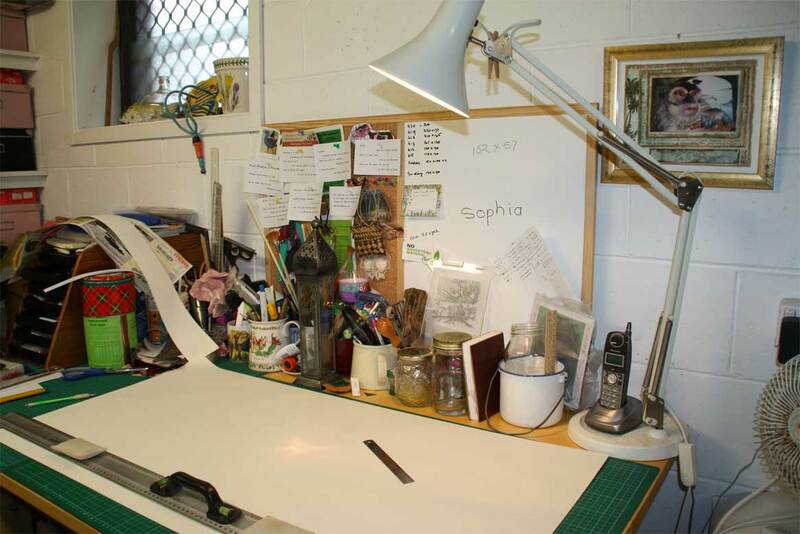 your studio looks so spacious ... i'm always envious of others who have a nice space to work in :) i am sure the book will come out beautifully and i'll be looking forward to see the finished product. the little ones are looking good! and when you mention huge schoolbags ... you know, you're right! they're getting "huger"! sometimes even bigger than the one carrying them. dunno what they make them study nowadays. EC: Lovely to meet a fellow Australian. 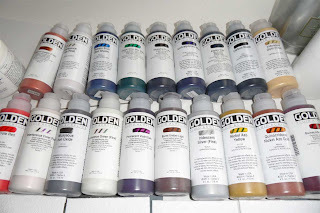 Luthien: If you do buy the Golden paints make sure you order them from the US. It was a fun course, wasn't it? I think your big little girl is about the same age as Fia - she comes home from school with homework, they certainly start them young.